As your customers continue to research and buy products and service online, you know that you need to improve your online presence. If you are looking for new clients or want to improve your content strategy, then a digital marketing consultant is what you are looking for. They will help you identify business opportunities and optimize your marketing strategy. Digital marketing is a must-have no matter your business or industry. A professional digital marketing consultant can help you whether you are a startup or an established business. Your consultant will help you improve your marketing strategy to increase traffic and boost conversions for your business. A digital marketing consultant will help you research your market and make a profitable Internet marketing strategy. They help you understand your customers and help your business grow through digital marketing. Online marketing isn’t easy, and it takes years of hands-on experience to learn best practices and how to produce ROI. Digital consultants have the knowledge and expertise you need to bring your business to the next level. Since digital marketing is an ever-growing field of business, you need to be wary of people who want to take advantage of your business. Here are the top 10 qualities you need to check before hiring a digital marketing consultant for your business! Your Orlando SEO consultant will guide your business on how to market to your target audience. Marketing to your target audience requires knowledge in different marketing channels and optimization techniques. The digital marketing industry is competitive. Your marketing efforts will not be effective if you do not identify and communicate with your audience effectively. Your marketing consultant should know how to identify and communicate with your target audience. A professional online marketing consultant will know the best channels to use based on your business goals and target audience. Understanding each of these channels is basic for consultants. Yet, it is amazing how many “digital marketers” don’t know how to optimize channels for specific industries. Be sure your digital marketing consultant can clearly explain the benefits of each channel based on your business goals. Content strategy is the process where you connect your different marketing channels together. A digital marketing consultant should know how to connect different channels together to reach specific business goals. While various channels work on their own, your business should operate channels together. Understanding how each piece works as part of the larger machine will help your business reduce cost and optimize revenue. A content strategy is like a car engine because different pieces serve different purposes to help drive the body. Your digital marketing consultant should know how to make your digital marketing strategy work to grow your business at each step. They should also be able to explain how different channels work together based on your objectives. Knowing how to use content will help your business increase traffic and conversions. Don’t hire an online marketing consultant who does not know how to explain the strengths of each platform. An SEO marketing consultant should know how to perform a competitive analysis of your business. This analysis helps you identify opportunities in the market. It also gives valuable insight on your competition’s marketing strategy. Competitive Research ensures you produce valuable content for your audience. Your digital marketing consultant will be able to instruct you on the best types of content to produce for your audience once the analysis is complete. This will save you money and time by making your campaigns efforts more efficient and effective. You should not begin producing any content until you understand what your competitors offer. Don’t hire an Orlando digital marketing consultant who does not do proper research on your competition. Knowing your competition is great, but knowing the needs of your customers is more important. Publishing content to meet the needs of your customers is the basis of content marketing. You will waste a lot of money and time marketing if you don’t know the needs of your target audience. A digital marketing consult should know how to direct content production based on market trends and demographics. From this information, you will be able to personalize content to improve your messaging and ROI. Digital consultants are able to identify gaps in your market and the align your product or service with the needs of your target audience. Don’t hire a marketing consultant who suggests that you just “jump into” content marketing without knowing your audience first. While marketing research will cost a little extra, it will save you a lot of time and money in the long run. Anyone can create loads of content. Creating valuable, relevant content for your target audience is the result of a focused marketing strategy. Relevant content helps drive conversions and sales because it addresses the needs of your customers. A professional marketing consultant will review your audience and provide direction on ways you can tailor your content to your audience. Personalized content performs better and will benefit your business. Never hire a digital marketing consultant who does not know how to use data to personalize content. Search engine optimization is the cornerstone of organic online marketing. It attracts the attention of Google to help drive traffic to your site. SEO copywriting is one of the most challenging aspects of digital marketing. It requires a technical understanding of search engines and how to write copy that compels your audience to take action. You should only hire an online marketing consultant trained in both search engine optimization and who is an effective writer. These skills will add value to your website and blog. A digital consultant can do more than just produce great landing pages and web pages. They can also use that knowledge to drive traffic and conversions through online ads and organic social media marketing. Needless to say, you should not hire an online consultant who has not excelled in creating great online content. Your customers search for you through online channels. This means that your online marketing consultant needs to know how to perform high-quality keyword research. This research should show what customers are looking for and how you can serve them better. The best keyword research tools. What keywords are most valuable for your business. How to use keywords in your content. Keyword research is based on the needs of your customers. You will be able to use previous market research as a guide for your keyword research. Your business will be able to discover valuable keywords based on the needs of your customers. Don’t hire a digital marketing consultant who does not know how to identify keywords based on those needs. Key Performance Indicators are the “milestones” of the digital marketing world. They tell you how well your campaigns are performing and these KPIs can guide your optimization efforts. You will need to select different KPIs based on your marketing goals. A professional online marketing consultant will know which KPIs your business needs to use. If you are not able to track the success of your campaigns, then you are not able to optimize them. Before hiring a digital marketing consultant, you should ask which KPIs they will track for each channel you plan to use. Double check their suggestions and make sure they provide frequent reports on a monthly or bi-weekly basis. It’s easy to walk to the walk; it’s harder to talk the talk. Anyone can say they will produce, but few consultants know how. Your business must measure and use a data-driven strategy. You will track different KPIs based on your marketing strategy. Your business will need to optimize each campaign based on analytics and report. Each channel will be tracked differently. Your digital marketing consultant should explain the differences between each channel and what metrics to track. They should also know how to interpret your data to optimize and drive your strategy forward. Online marketing can require money and time. Instead of starting from scratch, your digital consultant should provide direction to use existing content. Ask your digital consultant to perform a full audit of your marketing strategy. This will usually cost a thousand dollars depending on what you are requesting. This information will help you understand your marketing campaigns to save time and money. 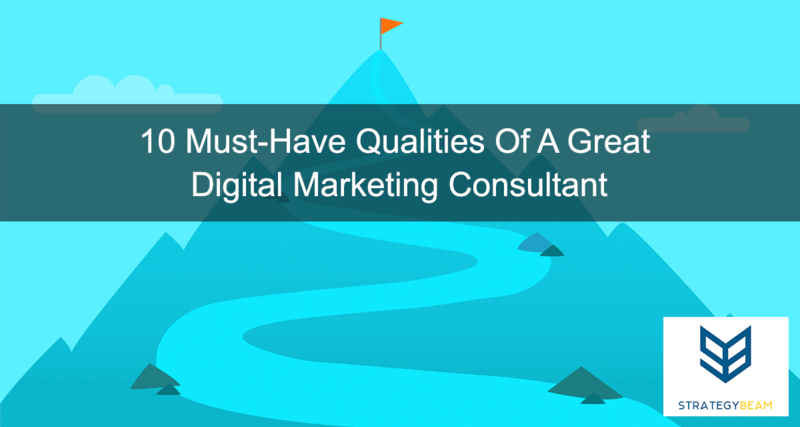 Now that you know the top 10 qualities of a great digital marketing consultant, you will be able to grow your business through online marketing. Whether you are hiring a full-time member or a freelancer, you will see better results if you review those 10 qualities. Be sure always to check your facts and ask for references. If you are looking for a professional digital marketing consultant, then shoot me an email and let’s talk about how we can work together!